Rating is 4 (based on 32 reviews). There is a yearning to understand humankind's first navigational abilities. Do you feel it? How could these people have done what they did without geosynchronous satellites in the sky broadcasting precise electronic signals? Were they smarter than us? The answer lies in that they did what they had to do to survive. Nowadays, we simply turn on our GPS and read out the exact position within 3 meters. So why Celestial Navigation then? Perhaps you're a purest, an engineer or mathematician, or perhaps you just want to satisfy your curiosity. At the very least you can always justify your yearning by the desire for a backup system. And now, with NauticEd you can satisfy that yearning for just $39. This Introductory Celestial Navigation Clinic will take you about 5 hours to complete. Upon completion, you'll receive a NauticEd Certification of Celestial Navigation Proficiency and you'll be able to take a noon sight of the sun and determine your position on the earth in both latitude and longitude. The noon sight is one of the simpler methods and so no matter what background you have you will dispel any intimidation with Celestial Navigation from this moment on. As with all NauticEd courses and clinics, you can return to brush up on your course work as many times as you desire for life for FREE. Please enjoy Captain Ed Mapes' Introductory Celestial Navigation Clinic. If you still have questions about NauticEd, the courses and/or the sailing certifications, contact us via email or phone we're happy to help. Otherwise register for the Introductory Celestial Navigation Clinic now! Learning how to use a sextant for celestial navigation has been very important to me as a USCG Captain and an engineer for a long time. Every tutorial I found online was confusing and frustrating, and my sextant sat in the closet for years. When I found NauticEd's Celestial Navigation class, I gave it a shot. The complex material is presented in a very straightforward, easy to understand manner. The subject matter is broken down into logical sections, which you are quizzed on before you proceed to the next, more complex material, one that is dependent on successfully completing the previous lesson. The course takes you through the steps of calibrating your sextant, taking a sight, making the correction calculations, time keeping, and looking up the pertinent data in the reference publications. Then you get to calculate a mock noon sun sight from scratch! You don't actually need a sextant to take the class, but it helps. I had some questions about the sight calculations, and NauticEd got right back to me. You can't ask for better than that from an online class you can take from home at your leisure. Thanks NauticEd! I'm off to the boat to take a noon sight. The earth rotates around the sun once every year, but it also spins and makes a revolution around its own axis every 24 hours. When the Earth's circumference is divided into 24 equal sections, each represents one hour of the day's time and occupies 15 degrees of arc. 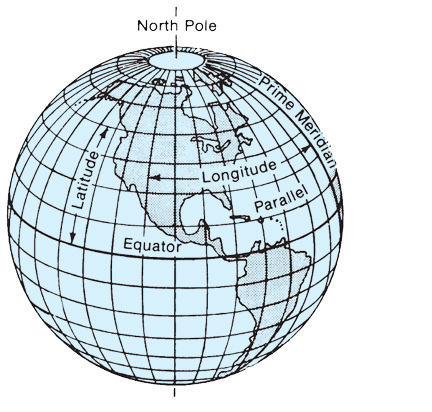 Figure 1 illustrates that each 15-degree segment is represented on a globe or chart by lines extending between the poles; these lines of longitude are called meridians. Meridians are widest at the equator, and become progressively closer together toward the poles. It is important to understand that lines of meridian are not equidistant at different parts of the globe. Figure 1: Lines of longitude extend between the poles, and are called Meridians of longitude. The following illustrates the slight complexity when measuring angles in a 3-D spherical geometry. 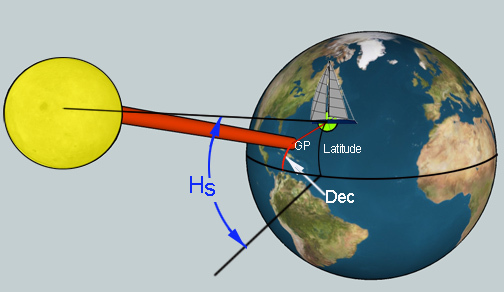 Here GP is the point whereby the sun would be directly overhead. However our vessel is east and north of GP. Thus the angle Hs that we would measure bares a complex relationship with the latitude and declination. Remember sine's and cosine's from geometry? 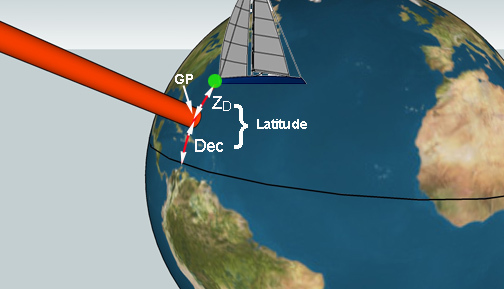 The zenith of our position is a point directly north (or south) of the GP. 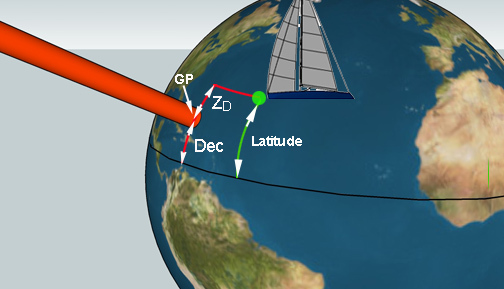 This helps us with the geometry a little because if we could project ourselves around the globe on the same latitude to the longitude of the GP then things would be a little easier. This is a partial secret of Celestial navigation. The following shows why it is much less complex to take a noon shot of the sun. When the vessel is on the same longitude as the Sun's GP, the sun is at it's highest point in the sky (for us at the position we are at - at that exact time). And if this occurred at the center of a time zone, then the time would be noon. In this clinic later we'll show how to account for not being exactly at the center of the time zone. Thanks for viewing the excepts - we're pretty sure you can extrapolate this information into knowing you'll have a full understanding of the theory behind and how to do a noon solar sight to determine your Latitude and Longitude position.